A skilled professional should always handle the process of roof installation in Angus. 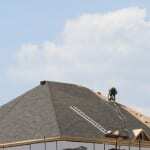 Many property owners find themselves in need of roofing services at some point. Most roofing materials aren’t designed to last forever, especially shingles, which are some of the most common options for both commercial and residential roofs. Many people choose shingle roofs because they’re more cost-effective than other options, but the time may come that you will need to have your roof replaced. For new construction, one important aspect of the process is having a high-quality roof installed on the structure. A skilled professional should always handle the process of roof installation. Every step must be done properly to avoid leaks and other damage to the roofing materials. The first step in roof installation is applying a waterproof barrier, which helps keep moisture out when it rains or snows outside. After finishing that task, a skilled roofing technician will begin laying the materials you selected for your new roof. Shingles are very popular for residential property owners, since they’re reasonably priced yet durable, especially in the changing climate conditions. Shingle roofs can last for at least 10 years without requiring any maintenance. The materials are resistant to fire and moisture, as well. If you’re looking for professionals to handle roof installation on your Angus, Ontario building, contact us at Slippery Slope Roofing. We have more than 50 years of combined experience between our owner and foreman, making us a top choice for customers who want the best. Contact us today to get an estimate on roofing installation at your property.